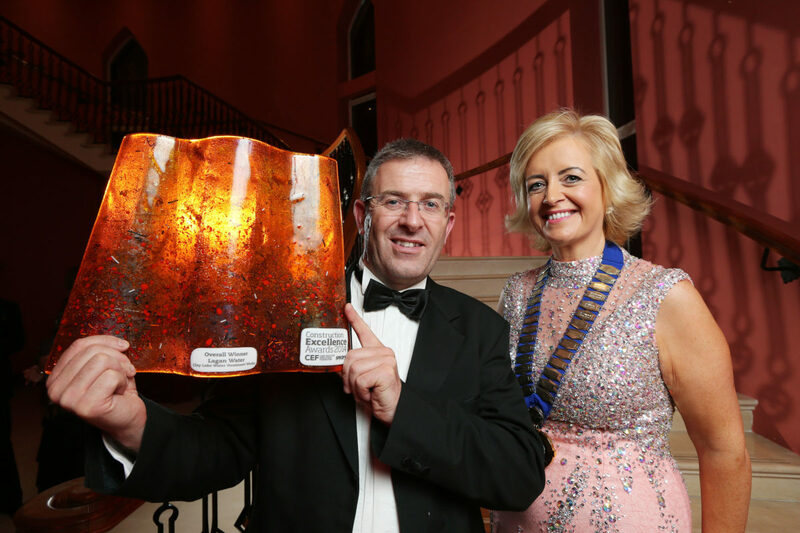 The winners of the Construction Excellence Awards 2014 were announced in Belfast on 3rdOctober 2014. Guest of Honour, Minister for Employment and Learning, Stephen Farry, revealed Lagan Construction as the winner of the Overall Award for the Clay Lake Water Treatment Works in Keady, County Armagh. The water infrastructure project, which also won the Utilities Infrastructure Award, emerged as the ultimate winner for 2014 against stiff competition from the other 14 category winners including the Redevelopment of Ravenhill Stadium by Gilbert-Ash and the new Antrim Area Hospital Emergency Department by Farrans Construction. Laganwater are absolutely thrilled to not only win the Utilities Infrastructure award but also win the overall award on the evening. This is the third year in a row which the Lagan Construction Group of companies has won the Utilities Infrastructure Award: 2014 – Laganwater: Clay Lake WTW, 2013 – A2 Bangor to Belfast Watermains Rehabilitation Scheme and 2012 – Duke St Pumping Station.